A moist, lemony sponge topped with chocolate ganache and marzipan decorations. It looks wonderfully festive and is a great alternative to traditional Christmas cake. 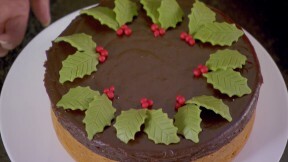 This tunis cake recipe by Mary Berry is featured in the Season 2 Masterclass: Christmas episode. Preheat the oven to 350F. Grease and line a 20cm (8in) deep cake tin with baking parchment. Add the butter, sugar, flour, ground almonds, eggs and lemon zest to the bowl of a freestanding electric mixer (alternatively use a sturdy bowl and a hand-held mixer). Beat on high speed for a minute. Spoon the batter into the prepared cake tin and level the surface with a palette knife or spatula. Bake for 45 minutes, then cover with foil to prevent the top from browning and cook for a further 15 minutes, or until a skewer inserted into the center comes out clean. Leave to cool completely in the tin on a wire rack. For the topping, pour the cream into a small pan and bring almost to the boil. Remove from the heat, add the chocolate and stir until melted. When cool but not setting, pour the chocolate mixture in an even coat over the cooled cake (that is still in the tin) and put aside to set. To decorate, color 175g (6oz) of the marzipan with green food coloring to turn it the color of holly leaves. Using a holly leaf shaped cutter, cut out 20 holly leaves. Mark the veins with a knife, lay over a rolling pin and leave to dry (this curls the leaves slightly). Color the remaining marzipan with the red food coloring and roll into 30 ‘holly berry’ size balls. Leave to dry. To serve, remove the cake from the tin and carefully peel off the parchment paper so that you get a clean line between the cake and the chocolate layer. Arrange the holly leaves and berries in a wreath around the edge of the cake. Equipment and preparation: you will need a 20cm/8in deep cake tin.